. :: THE INTRODUCTION TO NOSEBANDS! ::. A noseband has been one of the first materials in the world for riding with perfection. 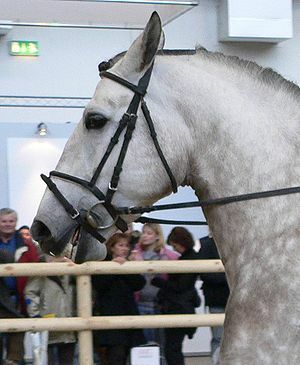 The English noseband all started in Ancient Persia, when humans invented a type of noseband made from rope, used for training young horses, the Persian’s called it the Hakma! Over many years the Hakma developed in to the English noseband we see today… and its usage has grown rapidly since the year of 200! 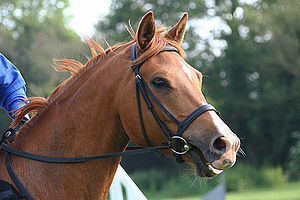 Today the traditional English noseband can be used to attach other equipment, like a martingale, a piece of tack used for the horses head carriage. It also keeps horses from sticking there tongue in the bit to avoid most of the pressure.The piece of leather tack can also help horses to stop pulling, and they can do much more…But actually, these days some English horses have nosebands on just for decoration, and it’s never attached to the bridle! Today Western riding also has nosebands, but they are usually placed on a normal Western riding bridle!